Coworking space as the name suggest is a place where people come and work on the projects together. It can be used by a small company with fewer employees or just a solo freelancer looking for a place to sit and work. For India, coworking is a fairly new concept that is getting extremely popular day by day. The advent of coworking space has ushered a change, a significant one to be precise. The boom in the realty sector speaks in volumes about this trend and entrepreneurs and their ventures have not shied away in expressing their conformation. A 2018 report by Small Business Labs forecasts a strong growth in shared working space segment, with as many as 189 coworking spaces opening around the world. A big number of startups emerging everyday needs space to work and getting a normal office space in a metro city may cost a bomb which a startup can't afford. Also, there are many freelancers and solo workers that are increasing with the rise of gig economy. But is coworking good for your company? 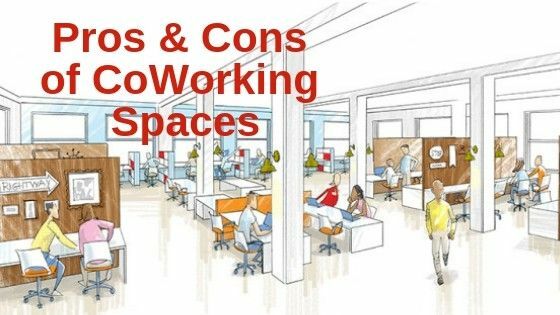 But before one decides to work, it is more than an obligation to detail out the advantages and disadvantages of coworking space to assist with the decision making. It’s time to make note of some observations! When you are in the midst of various like-minded individuals seeking to disrupt the conventional setup, the chance of building a strong network increases multi-folds. In these co-working spaces, there will be people with similar mindsets and interest that would allow user interactions that benefit the business. One might also get to meet people that are working on the same thing as them and might learn a few new things. One could even find potential business partners or investors in these places to build the business. Interacting with people will not only bring knowledge but will also open new paths of success. Ask any businessman or top-level executive out there about what constitutes success in the industry in the long run and you’d hear one common ingredient—connections. That is why it is said your network is your net worth. So reap the benefits of a well-connected network by shifting to a coworking space. No need to end up in a five year contract. To accommodate the diverse wants that startups and organizations tend to ask for, coworking space providers offer a multitude of leasing plans. Pay on a monthly basis, daily basis or why not maybe, on an hourly basis! Morever you always have an option to change if you didn't like or bored. Foosball tables, billiards, gaming consoles form a small part of the perks associated with leasing a share space. Lounge, chill out areas are of some attractions that entice startups into shifting their base to such a setup. If you were to set a relaxation room at your own cost, then the realization of receiving free perks would kick you hard! While this facility may not be available at all places, a few which offer the same enable you to take advantage of mentoring sessions by industry veterans organized occasionally. Then there are the frequent training and development programs held at coworking spaces to further enhance knowledge about the art of pitching, securing funding, etc. And how can we forget about restaurants and cafes in close proximity!? Homo Sapiens tend to be influenced by peers, either for the wrong or right reason. Coworking spaces give rise to the latter. In an office setting where everyone is working on out of the box solutions, it’s in the pipeline to be impacted, in a positive way though. Others’ creativity and innovation ought to ignite the ingenuity lying dormant within oneself. This isn’t assured but there’s a strong possibility. Most people do not want to work in an office because they have to work at a particular time. And they would like to work at their own time. Different people feel productive at different times of the day. Co-working spaces give you the freedom to choose work time. One can work and set schedules according to their will and comfort. This makes working more fun and builds productivity with the benefits of a co-working space. For startups with small team, Co-working spaces are fairly cheaper than a proper office space. One can pay less than half the rent that would usually be required to rent a full-fledged office. The best part is that space is already furnished, with all amenities; hence there won’t be a burden about getting the furniture and other equipment for setting up office space. This saves loads of money and becomes the key benefits of a co-working space. If you have madeup your mind to move to a coworking space we have made an exhaustive list of all popular coworking spaces operating across India. Once established, the organizations/startup can no longer function with a coworking space for an office. A full-fledged headquarter is needed in this case and in no way can shared working area meet this requirement. As a matter of fact, larger the corporate brand value, larger the official premise. The ambience may seem comforting initially, but gradually the eye would want to see something different. The extent of renovation permissible to members of such working areas is limited. And it’s well known that the ambience of a place is decisive in maintaining comfort level along with a good mood. Well then you know it's time to change the space and move to another one. Do I need to actually elaborate on this? Working in a cluttered work space with all kinds of commotion means productivity is sure to go down. Even a private cabin won’t do much good, unless it is fitted with sound absorbing walls. Sensitive information is also bound to be compromised in this setting, which means confidentiality and integrity are at high risk of being violated. Apart from privacy, Co-working spaces can become noisy and cause distractions. A 2015 Bloomberg report put forth the observation that per tenant, coworking spaces are more expensive than renting a single desk through some other means. Thus for an extremely small team, other cost-effective options need to be figured out. It is to be noted that coworking spaces are gradually bringing down this cost. Rivals under the same roof, and that in turn evokes a state of intense hostility. With various ventures in the same coworking space, there are chances that competitors hitherto unknown to each other, would end up in not so cordial rivalry. This could further trigger a chain of unwanted events accompanied with nothing but undesirable outcomes. In whatever country one resides, there are numerous of these workspaces that let one work at minimal pricing. So many of these can be selected according to your suitability can comfort. Having delineated the pros and cons of a coworking setting, it’s quite clear that such way of functioning is a double edged sword. Jump into the bandwagon keeping in mind the possible consequences which need not necessarily bring good news at all times. I think Mutual understanding among individuals is one of the most important thing to overcome the cons/disadvantages, thereby making co-working the path to the future of work.